Looking for the perfect 3 Day Bangkok Itinerary? Well, we have got it for you. Having been a resident of the city, I feel that three days in Bangkok gives you enough time to see and do a lot of the top attractions that the city has to offer. To help you in your planning I put together this Bangkok Itinerary to help you make the most out of your 3 days in the city. If you want to skip directly to any of the days or attractions, click on the links below. Check out how cheap you can fly to Bangkok below! Bangkok is a huge sprawling metropolis. There are so many things to in Bangkok, that it is important to make sure you make the most of your time there. 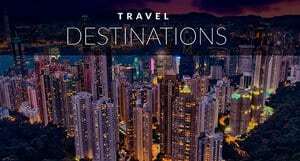 When putting this itinerary together, I wanted to give you a good balance of seeing the top attractions as well as experiencing the culture and food that Bangkok has to offer. If you are looking for places to stay in Bangkok, be sure to check out the guide below. Here is an interactive map (Just click on it to open in another window) that will help you see what kind of distances you will be covering as well as where everything is in relation to each other. This should make it easier to plan out you 3 Days in Bangkok Itinerary. Fun fact: in Thai, Bangkok is known as Krung Thep Maha Nakhon which is actually a shortened version of its longer name that is listed in the Guinness Book of World Records as the longest place name. This Bangkok Travel Guide shares the things to do in Bangkok for first-time visitors exploring the city for three days. There are many places to base yourself in Bangkok. We recommend Banglamphu (which is famous for the backpackers street known as Khao San Road or Sukhumvit which is close to downtown and walking distance from the Siam Centre. We also once stayed at the Sheraton Centre Royal Orchard on the Chao Phraya River and loved the location. It had free shuttles to the MTS Skytrain and we could easily explore all the Bangkok things to do in the River. From these areas, it is easy to get around Bangkok and you'll have plenty of options for accommodation, dining and booking tours. One of the higher end hotels in this backpacker dominated area. Features elegant rooms, a pool and a view of the river. This Japanese brand’s hotel sits close to the Ploen Chit BTS stop. The 35th-floor infinity pool overlooks some stunning views. Getting to downtown Bangkok is easy. You can take the Airport Rail Link from Suvarnabhumi Airport, via Makkasan Station, to Phaya Thai station in central Bangkok. Once you get into Bangkok it is cheap and easy to get around the city via taxi, tuk tuk, Skytrain or subway. Begin your Bangkok explorations at the Grand Palace. This is one of the top Bangkok attractions, so it makes the perfect place to start your Bangkok adventure. Built in 1782, it was once the royal residence and housed government administrative buildings. It has since been opened to the public and remains a popular place to get a royal experience. Inside the grounds sits the famous Wat Phra Kaew aka Temple of the Emerald Buddha. My favorite things about the palace are all the golden statues and jeweled mosaics that are simply breathtaking. Make sure to dress properly when visiting - covered shoulders and legs - since there are sacred temples located inside the palace complex. Or take the skytrain to Saphan Taksin Station. This stop is at the Chao Phraya River. You can then hop on the Chao Phraya Express which stops at the Grand Palace Complex. There are local water taxis as well. 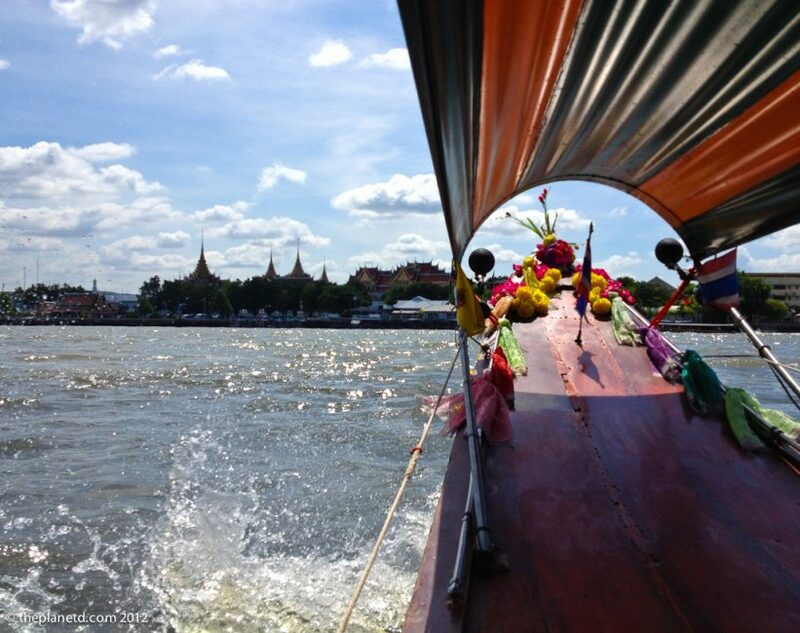 See our video on how to navigate the Chao Phraya River. A great way to get acquainted with any city when you first arrive it so take a city tour. It is also a good way to see many sites in a short amount of time. We use Get Your Guide for our city tours around the world and like them because they are easy to book, cancel within 24 hours for a full refund, and you can often book last minute. Bangkok Flexi Walking Temple Tour - See the top Bangkok temples in one tour including the Grand Palace once home to the Kings of Siam, Wat Pho, home to the reclining Buddha and Temple of the Dawn, Wat Arun. Check out this page for more details. Private Airport Transfer - Even though it is easy to get from the Airport to downtown Bangkok, we often love being picked up at the airport after a long flight. A driver will be waiting for you at arrivals with your name and will take you directly to your hotel. Find out all the details here. From the Grand Palace, walk just behind to find one of the most famous Thai temples in Bangkok. The Thai word for temple is 'wat,' and this temple houses the Reclining Buddha, a massive golden statue that takes up the entire temple. Again, I should note that proper dress is required when visiting this and any other temple in Thailand: visitors should have their shoulders and legs covered. I recommend having a light shirt to throw on and a long skirt or pants is best. They do provide a cover-up at this temple for visitors who are not dressed appropriately. At the back of the grounds is a famous Thai massage school. If you feel tired from all of the walking, why not stop by for a foot massage? They are rumored to be the best and are quite affordable. After visiting the Grand Palace and Wat Pho, you will probably be hungry. Grab lunch at one of the restaurants along the banks of the river that offers a view of Wat Arun, your next destination. I recommend The Deck, which has great drinks and food. After lunch, take a short ferry ride across the river from Wat Pho and the Grand Palace to Wat Arun Temple. It is better known as the Temple of the Dawn. The ferry ride is just 3 baht! You may recognize this temple’s central spire as it is famous in the skyline of Bangkok along the river. I loved visiting simply because I got to see another stunningly beautiful Thai temple. From Wat Arun, take the ferry back across the river and grab a taxi (or walk ) over to Khao San road. There are plenty of souvenir shops here to check out, but I recommend choosing one of the many massage parlors for a famous Thai Massage. After all of the walking, you may also opt for a foot massage. After your message, you can grab a bite to eat for dinner at one of the many restaurants, or try some of the street food available all along the length made by locals. Keep an eye out for the vendors selling up fresh bugs! Be brave and give it a try - I once had an entire meal of just bugs! Those looking to party in Bangkok should stick around into the evening, as this road draws lots of tourists every night. It is most popular with backpackers and budget travelers due to the large number of cheap hostels in the area and affordable drinks at the numerous bars. The most famous drinks are known as 'buckets' and essentially are a pail filled with your choice of alcohol and mixer. Bottoms up! On the second day in Bangkok, check out some more famous cultural sights, and markets. Click here to open the interactive map. Bangkok is famous for its floating markets, but they are farther out of the city. If you have your heart set on a Bangkok itinerary with floating markets, we suggest seeing Damnoen Saduak floating market located 90 minutes outside of the city. You can book a half day tour to full day tours with Get Your Guide, they have plenty to choose from. If your visit happens to span a weekend, I highly recommend checking out this famous weekend market. 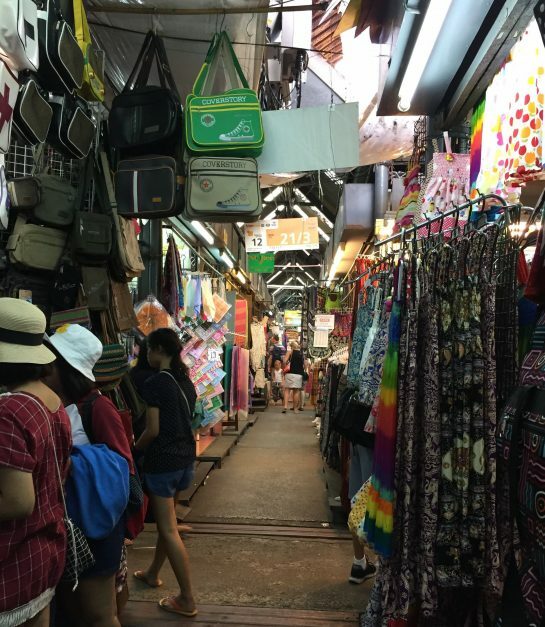 The sheer size of this market is part of what makes it such a destination in Bangkok. Shoppers can find just about anything here, at crazy cheap prices. The best time to visit is earlier in the day on the weekends, before the crowds and infamous Bangkok heat hit. Cost: Free to walk around! Only spend on what you want to buy (and everything is super cheap)! After shopping, take the BTS Skytrain down to another famous landmark. The Jim Thompson House is a great place to visit, especially for those interested in Thai architecture and art. This museum is a tribute to the man, Jim Thompson, who came to Thailand and started a textile business to promote Thai silk. His business is still thriving to this day. Many people come to visit his house as it is an excellent example of different Thai architectural styles. During the tour, the guide tells visitors all about Jim Thompson's life… and mysterious death in the Cameron Highlands of Malaysia (they never found his body!). While the house is lovely, my favorite part was the jungle-like garden outside. It made me completely forget the noise and chaos of the city. Just down the road from the Jim Thompson House is the Bangkok Arts and Thailand Cultural Centre. This is a great location for those interested in seeing contemporary art exhibits or cultural events. If you are wanting to add some cultural experiences to your Bangkok trip planner, this is a good place to start. There are also cafes, bookshops, craft shops, and art galleries. The exhibition and events regularly change, so be sure to check their website in advance for an up to date look at what is being offered. This Hindu shrine is a major landmark in the middle of Bangkok. From the Bangkok Arts and Culture Center, walk through the many malls (take advantage of that AC!) or the take the BTS a few stops to Chit Lom. This shrine, dedicated to the god of creation, was originally built in 1956 to ward off bad luck for a hotel that was built nearby, but now draws hundreds of people every day. It is interesting to see how the throne is incorporated into the life of locals, who stop by during breaks, or on their way to and from work. You can also sometimes catch a traditional dance performance by the dancers hired by worshippers to give thanks for their prayers. You might be feeling hungry for dinner by now. While there are a multitude of restaurants in the malls downtown, I recommend walking up the Neon night market. Any Bangkok trip should include exploring at night and this is a great place to start. This is a great place to grab authentic Thai street food and many other varieties of food including seafood, grilled cheese, octopus, ribs, and MUCH more! There are also a few bars and place to buy beers and drinks, including a ‘galaxy cocktail,’ which is a glittery concoction that looks too fancy to even drink. This is one of the best places to visit in Bangkok at night. Cost: All food and drinks are very affordable (few hundred baht). If you want to continue your night out, head down to Soi 11, and the rooftop bar Above Eleven. While it may not be the towering rooftop in other hotels, it still offers a great view in its open-air design. Just around the corner, you can also find the Havana bar down a small alley off Soi 11. It's a secret speakeasy with a Cuban theme that you can only access by plugging in code inside a phone booth. Ask the guy selling Cubano sandwiches in front of the phone booth for the password. There are plenty of other bars and night clubs in the area, making for a fun night out in Bangkok! Cost: Drinks cost from 90-180 baht depending on the bar. Going out late at night is one of the best things to do in Bangkok. There's a reason the Hangover chose Bangkok for its sequel. It's party central. If you would like to explore another popular late-night are check out a Soi Cowboy. Located just off the BTS, this street is one of a few red light districts in Bangkok. It is most famous for its ‘ping pong' shows. These infamous shows are not for everyone, but many tourists are curious enough to go and see them. If a Go Go bar is not up your alley, opt to spend the night out on Soi 11 which is a popular late night hang out full of bars and clubs (see above). Cost: Drinks are from 90-180 baht depending on the bar. You have now spent two days in Bangkok. Are you ready for your final day in the city? The final day of your 3 Day in Bangkok Itinerary takes you to Chinatown, one of the oldest neighborhoods, Lumpini Park (for a bit of green) and the Sala Daeng area for a cooking class and famous rooftop bar. Bangkok is an exciting city and three days is enough to get a taste of its energy. So, let's get started with your final day in the City of Angels. On your last day in Bangkok, we will start in Chinatown! Take the MRT to Hua Lamphong station and walk down the popular Yaowat road to the Sampeng Lang Market (also referred to as Soi Wanit 1 by some). This tiny walking street in Chinatown offers a unique shopping experience. What makes this market appealing is the fact that shoppers can find just about anything here, including fabrics, electronics, toys, beauty supplies and much more. The best part is that everything is sold at wholesale prices. I often came here if I knew I wanted to buy a few of the same thing for friends back home (or for myself!). The street is really narrow and it can get congested. However, if you want a shopping experience that is completely different from what you are used to, I recommend checking it out. The maze of streets that make up this market means you may get lost at some point, but that's part of the fun! Try and give yourself time to really immerse yourself in this Chinatown staple. Cost: Free! Just depending what you want to spend while shopping. Read our post on how to Bargain like a pro. When shopping at markets, you will have to barter over the price. In Bangkok, we recommend never accepting the first price they say. So have some fun and start talking them down. It's tradition! After walking, and maybe shopping, on Sampeng Lane, visit the famous Wat Traimit, or the Golden Buddha Temple. Inside this temple sits the largest solid gold Buddha statue in the world! This temple is made up of four floors. The Golden Buddha is located on the 4th floor of the temple. Underneath on the 2nd and 3rd floors are the Chinese Cultural Center. The museum sheds light on the history of the Chinese in Bangkok as well as information on the discovery of the Golden Buddha. I found it very interesting, and suggest you get the ticket that includes all the levels. After visiting the temple, take the MRT a few stops to Lumphini Park. This is the biggest park in the city and offers a welcome respite from the chaos of the city. The park has many paths and walkways that are great for some peace and quiet after a busy day Chinatown. The small lake in the center offers visitors the option to rent paddle boats for a small fee. You can also buy fish food to feed the fish who inhabit the lake. Make sure to keep an eye out for the giant monitor lizards which roam freely - they don't attack, but it is wise to keep your distance. I was so surprised the first time I saw one there! If you are staying in Bangkok for a few more days and are in the mood for an exercise class, you can join Thais of all ages and dance along to music in one of the popular aerobics classes in the evenings. Cost: Free! Boat rides are 40 baht (with a 40 baht deposit that you get back once you return within the time frame of 30 minutes). For 20 baht more you can get a bag of bread to feed the fish. After wandering the lovely Lumphini Park, it is time to eat! Walk over or take the BTS to the Silom Thai Cooking School for their afternoon class. Thai food is some of the best in the world, and this cooking school offers classes on how to cook all of the most popular dishes. They offer classes every day of the week. What I liked most about them was that they include a market tour in order for guests to see the actual ingredients used in the dishes. At the end of the class, you get a cookbook with all of the recipes and many more to take home with you! I took the cooking class here THREE times while I was living in Bangkok - it was that good! If you want to book a Thai Cooking class in advance you can check out a list of classes around the city here. After your cooking class, you have a choice of which nearby rooftop bar you would like to visit to watch the sun set on your time in Bangkok. The Sky Bar, at the top of the Lebua Hotel, is one of the most popular rooftop bars in Bangkok. Part of its fame comes from the scenes filmed there in the movie The Hangover 2. Fans of the movie will immediately recognize the large golden dome. The view at this bar, which claims to be one of the highest in the world, is spectacular, particularly at sunset. Cost: Drinks cost between 300 and 850 baht, with most cocktails costing 650/690 baht. If you prefer walking (which you might after the meal from the cooking school), head to the Banyan Hotel for an equally magnificent view of the city. At the top of this hotel, the Moon Bar offers equally stunning views of the city. It was voted one of the top rooftop bars in the world, and makes a great place to watch the sunset and the lights of Bangkok to come on. Cost: Drinks cost between 300 - 900 baht. Believe it or not, the main attractions and sites of Bangkok can be seen in three short days. If you plan your route well and take public transportation, either the BTS or MRT where needed, you can see a lot of what Bangkok has to offer in a short amount of time. Bangkok is a huge city, but it is not impossible to see and do a lot during your brief stay. To really take in the culture and vibe of the city, you will need far more than 3 days, but to see its highlights and its most famous sites, you can do it. If you are planning on 4 days in Bangkok, have a great time and check out more of my Bangkok itineraries and travel tips below. In Bangkok, visitors have a range of options to choose from for getting around. The BTS sky train has frequent stops with access to many of the most popular tourist destinations. It is relatively cheap, and train cards can be topped up in stations very easily. The BTS train has two lines, the Sukhumvit line and the Silom line. Pay close attention to the direction and line you are getting on when changing at connecting stations. The MRT is the underground system in Bangkok. It uses a different card from the BTS, but it is possible to purchase single rides without one. For a more traditional feel, try a tuktuk. These taxis are a fun way to take in the sights and sounds as you cruise to your destination. Taxis are another option for getting around. In Bangkok, you can take a car taxi or a motorcycle taxi. The latter are much cheaper, but not for the faint of heart, as weaving through Bangkok traffic can be hair-raising. Always make sure to agree to a price BEFORE getting in a taxi or tuktuk. Negotiating is encouraged, as drivers will often inflate the price for visitors. 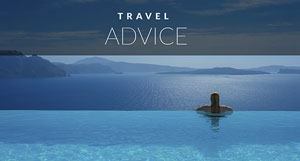 Have a set price in mind and don't fall for the 'tourist price.' I was often shocked by what tourists would pay for a taxi. Sometimes taxi drivers will refuse to take passengers; they may hear your destination and decide they don’t want to drive there. It is not personal, although it can get frustrating. Other drivers may refuse to turn on the meter. Keep trying until you get a taxi for a price that works for you. Thailand also has a ride sharing app, much like Uber or Lyft, called Grab taxi. Just download the app and call a ride on demand, with a price displayed. You an call a car or even a motorcycle taxi using the app (the later usually being much cheaper and good for single riders). Stella wrote an in-depth guide about where to stay in Bangkok. 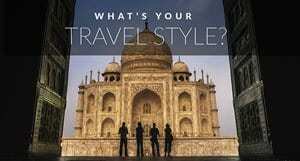 By clicking on the links below will take you to a break down of each Bangkok neighborhood and suggested hotels. Banglamphu – Home to the Grand Palace and Khao San Road. Bangrak – For those on the hunt for amazing food. Chinatown – One of the oldest areas of Bangkok. 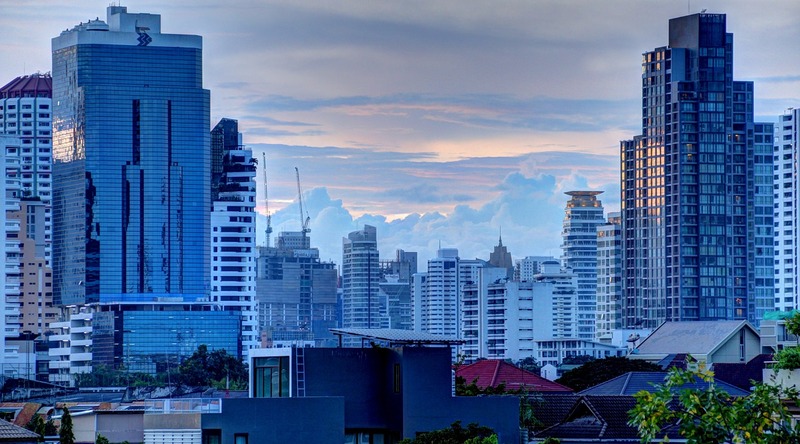 Sukhumvit – A modern and cosmopolitan area in central Bangkok. Siam – For those looking to shop 'til they drop. There is really no bad time to visit Bangkok. It is hot all year round. There are three main 'seasons' in Bangkok. The hottest season, which runs from March to June, with April typically being the hottest month. If you are looking to cool off, visit during 'Songkran,' the Thai New year. The holiday is celebrated with a three-day long water fight - the perfect way to beat the heat! This usually takes place in April. The rainy season runs from July through October. Expect rain on most days. Thunderstorms can appear suddenly and unleash huge amounts of water that leave the streets completely flooded. The most comfortable season in the city is between November and February. The city is still very hot, but there are some days when the temperature dips into the 70s. You now know what to do in Bangkok for 3 days, but that shouldn't stop you. We've returned to Bangkok again and again and always found something new. Bangkok tourism is growing each year and the city is becoming more modern with each skyscraper built. For more Bangkok things to do, check out Stella's city guide with a list of everything oyu can see and do in the city. Did you enjoy this Bangkok Itinerary? Why not Pin it on Pinterest to plan your future vacation? Stella is the author of the travel blog Stella’s Out where she documents her adventures on a budget. As a traveling teacher, she lived in South East Asia for 2 years and now resides in Honduras, Central America. You can find her on Facebook, Instagram, and on her website Stella's Out. 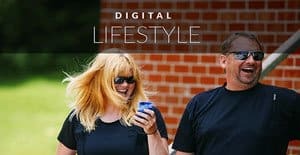 Stella's out was awarded one of the top Thailand travel blogs and is considered an expert Bangkok blogger. 5 Responses to "3 Days in Bangkok – The Perfect Bangkok Itinerary for First Timers"
Lumphini Park is amazing. Wish Bangkok had more parks like this. Awesome itinerary! I might try doing these on my next Bangkok trip! Thanks for your sharing. Really Bangkok such a wonderful place and the golden Buddha temple is one of my best place in Bangkok. Loved visiting Bangkok, wish we stayed longer as there is so much to do and see!